Description: Caliber: 260 Remington - Mag. 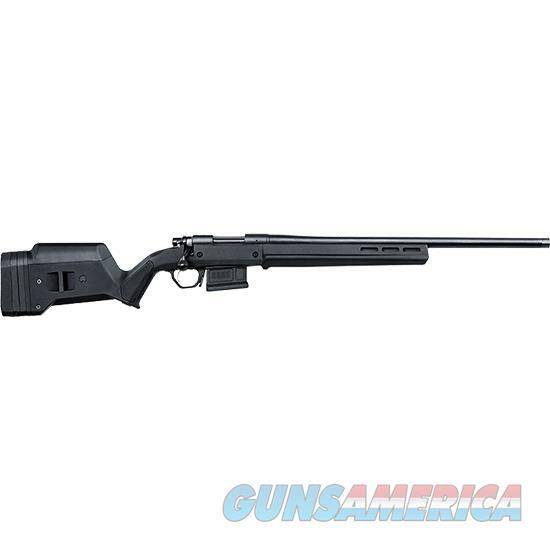 Capacity: 5 DM - Barrel Length: 22 - Twist (Right Hand): 1:8 - Overall Length: 41.5 - Length of Pull: Adjustable from 13-15 - Drop (Comb): Adjustable - Drop (Heel): 7/8 - Barrel Material: Carbon Steel - Barrel Finish: Black Cerakote - Stock Material: Synthetic - Stock Finish: Matte Black - Avg. Wt. (Lbs. ): 8.75 - Remington rifles built on the Model 700 action have made their mark from the front lines of combat to the firing lines of local shooting ranges. Adding to that reputation of tactical superiority in 2017 we proudly introduce the Remington Model 700 Magpul. - Features: - Carbon steel barreled action with tactical bolt handle - Metal finished in black Cerakote - 22 Heavy Free-floated barrel with 5-R rifling - Threaded muzzle with thread protector - X-Mark Pro Externally Adjustable Trigger -Breaks like glass has virtually zero creep and offers a level shot control unmatched by any factory trigger today. - Magpul Hunter stock with aluminum bedding bloc -Designed to fit any shooter thanks to an adjustable length-of-pull kit and three comb-height inserts.